I’m going to have a sleepless night. 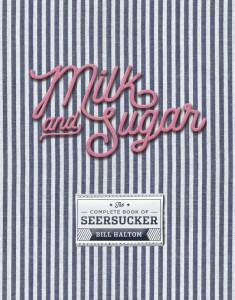 That’s because tomorrow I’m having a book-signing for my sixth non- bestseller, Milk and Sugar: The Complete Book of Seersucker. Over the years, Burke’s has been the site of signings for a wide range of writers including John Grisham (he had his very first signing at Burke’s), Richard Ford, Ann Beattie, and even Archie Manning. And tomorrow, Burke’s will host a signing for the non-legendary Bill Haltom. So why will I have a sleepless night this evening? Simple. I’m always worried that absolutely no one is going to show up for my book-signing. Book-signings can be exhilarating, but they can also be pretty demoralizing. I once had a book-signing at a store in Cincinnati in which I sold exactly one book. And it was bought by Claudia’s Aunt Geneva, who lives in Cincinnati. That’s right. I flew all the way to Cincinnati to sell a book to Aunt Geneva. On another occasion, at a book-signing in Jonesboro, Arkansas, I deeply disappointed by a very nice lady who was excited to see me, until she realized I was not who she thought I was. I was sitting at a table in the book store with a stack of books in front of me and a pen in hand, just waiting to sign books for my legions of fans. But there was no line in front of the table. For a while, I sipped coffee and prayed that someone would come buy a copy of my book. I was even willing to give the copies away. Finally, a lady slowly approached the table, greeting me with a big smile. She seemed genuinely excited to see me. She was being escorted to the table by a young woman who appeared to be her daughter. I was confused by this response since the book-signing that day was for my very first book, and therefore there was no way that this nice lady had read “every one” of my books, since there was only one, and she had not yet read it. “No ma’am,” I responded. “I hate to disappoint you, but I’m not John Grisham.” “Well then who are you?” demanded the extremely disappointed reader. “I’m just a lawyer from Memphis who loves to write,” I confessed. Well, I just hope and pray a few folks show up at Burke’s Bookstore tomorrow, and I hope that sweet lady from Jonesboro doesn’t have her daughter drive her to Memphis in the hopes of getting a book signed by John Grisham. Sam Elliott: I have been able to have no-show book signings without having to go out of state, Bill. Laura Bishop: So sorry I will be in hot springs for my daughter's volleyball otherwise I'd be there - you mean a lot more to me than Grisham! Jack Greiner: Bill, what does John Grisham have that you don't have? Other than a private jet, a mansion and a yacht? But those are material and ultimately meaningless items. You have my respect and admiration. That is priceless. And, sadly, flightless.